Today, despite being July 3rd, was the Heritage Festival 5 mile race. I'd been second in this race 5 years in a row to 5 different people. My biggest fear is usually to finish worse than second, as I've made such a fuss about being second so much. I have been taking my running even less serious than usual at this point in the year, so my fear were especially heightened. Tim also decided to run, despite the statistical improbability of him beating me a 2nd time. I felt tight on the line and was concerned with the number of singlets that were around me. There were lots of kids who had a lot to prove I think; a 4:20 sophomore from Colonial Forge, the VA Runner racing team, Joey Murray (Stafford grad), and John Piggott (admittedly not a kid). I didn't think it would be easy. 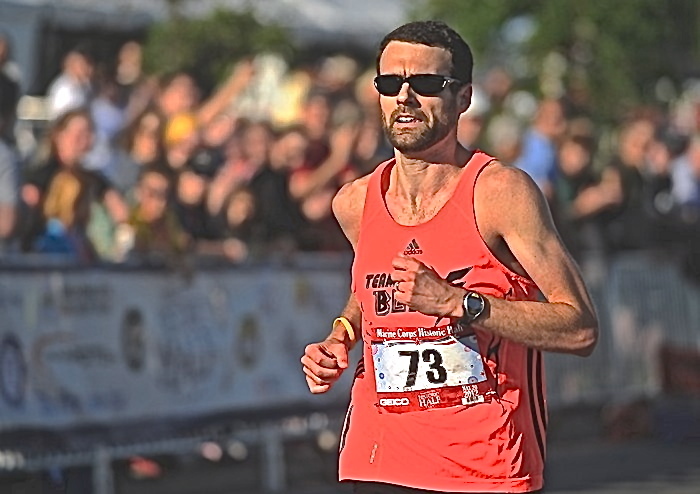 Jeff Poindexter, doing his best Bolata Asmeron impersonation, took most of the pace after the first half mile. A group of what felt like 10 of us went through the first mile in 5:11, probably 20 seconds behind Tim. Everyone around me seemed to be breathing a lot harder than I was. I was near the front of this group, trying to stay behind Poindexter; but he fell off as we went under the Rt. 1 bridge. I consciously tried not to separate yet, because of the first mile, but they were falling off. The 2nd mile was 5:16 and 3rd was 5:19. When I went through the 3rd mile and they said 15:45, I thought I might be able to run under 27 after all. Just two 5:30 miles. But I was noticeably thirsty, and the group with me was gone. Tim and I cooled down on the course and I was fading the last mile or two so I had to pick up the pace just to get there. We went real slow though and missed the awards ceremony. I think it's the only race that does the overall awards first. I didn't stretch and got in the car immediately to drive to the beach. That was at 9:33. I arrived at the beach at 5:45. I stopped for 30 minutes in Newport News to have lunch with David. I got to North Carolina at 2:00. It's probably the worst traffic I've ever experienced, definitely as an adult.